The original houses of Belfield, Ruth Ferguson. Adm. €4/students €2. Military History Society of Ireland, Wexford Town Library. The war at sea around Ireland, 1914–18, Pat McCarthy. Medal Society of Ireland, Knox Hall, Monkstown Village. Medal and militaria fair—buy, trade, swap or get free valuations/identifications of medals. Heritage Services Phoenix Park, Phoenix Park Visitors Centre. Ashtown Lodge occupants from 1775 to 1989, OPW staff. Royal Society of Antiquaries of Ireland, 63 Merrion Sq. S.
Surveying our archaeological landscapes and monuments: 3D documentation challenges and opportunities, Robert Shaw. Thomond Archaeological & Historical Society, T.1.17, Tara Building, Mary Immaculate College. Everyday life and politics in Limerick in 1918, Brian Hughes. Kilmacanogue History Society, Glenview Hotel. The Baryon and Childers families of County Wicklow, Seán Murphy. Adm. €3. Kilmacud Stillorgan Local History Society, Glenalbyn Sports Club. Irish doctors in World War I, Joe Duignan. Adm. €3. Enniskerry History Society, Powerscourt Arms & Country House. The sinking of the RMS Leinster, James Scannell. Adm. €5. The translation from military to civil service: the O’Donnell counts in France, 1690–1879, Ambassador Francis O’Donnell. Friends of Medieval Dublin, Civic Offices, Wood Quay. The priest’s tale, Caoimhe Whelan. Tallaght Historical Society, County Library, The Square, Tallaght, Dublin 24. Three Dublin families in World War I, David Power. Skerries Historical Society, Keane’s Bus Bar. Tufa stone in medieval Fingal and beyond, Niall Roycroft. Antrim and Down Branch Western Front Association, Linen Hall Library, Belfast. War stories: community perspectives from the centenary conference. The business of Dublin in the early twentieth century: an overview of the retail and financial sector, Mary O’Connell. Knocklyon History Society, Iona Centre. Commemorating 1919 and the momentous issues leading up to it, Liz Gillis. Michael Joyce MP, 1900–1918, Tadhg Moloney. Foxrock Local History Club, Parish Centre, Foxrock RC Church. AGM followed by The armistice of November 1918, Ronan McGreevey. Adm. €5. Dún Laoghaire Borough Historical Society, Royal Marine Hotel. Pre-Famine Dublin: a calamity waiting to happen, Vincent Ruddy. Adm. €3. GPO Witness Visitor Centre, O’Connell Street. 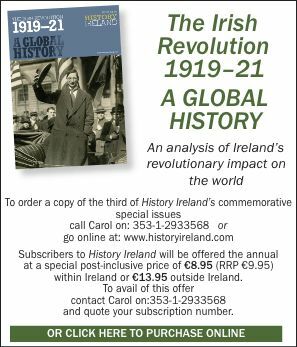 Rebel Women of the 20th Century—Dora Maguire, Ida Milne & James Curry. Bray Cualann Historical Society, Royal Hotel. 400 years of the Brabazons in Bray, Brian White. Adm. €5. Dublin City Library & Archive, 138–144 Pearse St.
Local History Day, various speakers. Clondalkin Historical Society, Áras Chrónáin, Watery Lane. Crannoga: the Irish-built artificial islands in lakes, John Dolan. Charles Cameron—saving the city, Ken Finlay. Followed by AGM. A taste for Gothic, Judith Hill. Rathmines, Ranelagh & Rathgar Historical Society, Rathmines Town Hall. St Mary’s College and its place in the history of Rathmines, Charlie O’Neill. Adm. €3. Art, artifacts and old buildings in Dublin and Wicklow, Peter Pearson. Adm. €3. The building of the Kish Lighthouse (DVD) and some of the history of the Kish Bank. Adm. €3. Bray Cualann Historical Society, Ballywaltrim Library. Christmas 1943 in Bray, James Scannell. Old Dublin Society, Dalkey Library. Christmas 1919 in Kingstown and Dalkey, James Scannell. ‘Home for Christmas’: John Francis O’Reilly and John Kenny, the last German agents to ‘drop in’, Anthony Kinsella. Western Front Association (Dublin Branch), NMI, Collins Barracks. Polish armed forces in the Russian army in the First World War, Marcin Hasik. Adm. €3. The Widow’s Tale, Dawn Klos. Tallaght Historical Society, County Library, The Square. Leo Swan Memorial Lecture: Ireland’s underwater archaeological heritage, Cormac Lowth. GPO Witness Visitor Centre, O’Connell St.
Rebel Women of the 20th Century—Charlotte Despard, Margaret Ward. The dioceses of Meath and Ossory in the seventeenth and eighteenth centuries, Michael O’Neill.